It is just what it says it is. I called it this because of when my kids were younger. They would get a gift, Dad and Mom would take the pieces out and set the box aside so THEY could assemble the toy that came in the box, while the kid played in the box! This is almost the same type of thing except maybe this time the kids will be helping you put the meal together. In this refrigerated box you will receive a week’s worth of the right amount of FRESH ingredients from those meals you have ordered and the recipes to make them.One place can even include videos if you need the extra help. They are proportionate servings to make it healthier. You provide the items to prep the food, cook the food in whether it’s pots, pans, or ovenware. Enjoy when you sit down to eat it. Seasonal items are used, so some recipes are only available at certain times of the year. I would be sure to have it delivered where someone is around when it arrives or you might be going through the drive-thru if people learn it’s food. You do have to find fridge space to keep the ingredients and leftovers (if there are any). Have you run yourself ragged taking this kid to soccer practice and that kid to piano lessons, and just don’t want to make another stop at the grocery store with ALL the hungry kids with you? Maybe you can’t drive anymore with MS, but still need to feed your family. 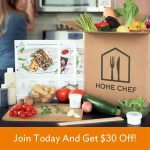 Order the meal kits and the shopping is already done for you. Just choose the meals when you order them and all you have to do is prepare and eat the meal! According to an independent third-party study, Home Chef has the highest rate of customer satisfaction among leading meal kit companies. Home Chef is more affordable than shopping for the same ingredients at a supermarket. Not only do their meal kits save you time, they can save you money per meal. The kits include the right amount of FRESH ingredients and also include the amount of oils, spices, and “extras” (like cheese) needed in the recipes. Tips and tricks for preparation are included also. You don’t have to worry about buying a big bottle of oil or spices at the grocery store you won’t use again. You even take a chance on NOT FINDING that oil or spice in your grocery store. You can select any number of meals, but most order 3 meals or more. Some people even order 2 of the same meal at a time. The kits will arrive the next week in an environmentally-friendly insulated box with ice packs. So you just put them in the refrigerator until ready to prepare. Control your deliveries by skipping a week or pausing or canceling your account. Ingredients in the box are organized to each recipe making it just a little easier for you! They make fancy food approachable and inexpensive. You get everything you need to whip up a restaurant-caliber meals for two people or make sure you order enough for the family. It will take a novice chef approximately 30 minutes to fix one of their meals. Worried about choosing from the same meals over and over? They add 8 new meals each week. Based in Chicago, their cuisine is inspired from the Midwest and their meals are based on the preferences of their customers! Decide on the meals ahead of time, pay and order them. Then they are delivered to your door. No fighting the grocery store and no deciding what drive-thru restaurant tonight.You provide the cooking tools and place to prepare. Get everyone involved in cooking the meal and you just might have a little fun! In just about 30 minutes a novice cook can select one of the ordered meals and get a home-cooked meal on the table for your family. Healthier eating and you can see EVERY INGREDIENT you are eating. Are you on a restricted diet, are you vegan or vegetarian they have special meals to choose from. At Blue Apron, the chefs and farmers work together to make food more sustainable and recipes more delicious for you to make a week of meals. You get proportioned ingredients and step-by-step recipes to make your meals. You choose the meals ahead of time, place an order, and it’s shipped to you. No grocery store to fight,little to no waste on ingredients, and no last-minute decisions to make on what to fix that night. You simply take the ingredients from the box, prepare the meal, cook, and serve. Want to give a meal, but don’t know what to give, get a gift card and let that person decide. Six recipes from 6 countries and no flying or passport required! For 6 weeks Blue Apron is teaming with Airbnb to bring you a new recipe each week from around the world with Airbnb experience. Get $60 Off Your First 6 Weeks! Blue Apron is always shipped free to your home! This is a meal kit you don’t have to do preparation for. All you have to do is cook the beef patties to your liking. Every “Feast Kit ” for 2 people comes with 2 massive “burgas”, ingredients and original recipes to put them together, 16 oz. french fries, 16 oz. of gourmet mac & cheese, side of baked beans AND a side of cole slaw. All you have to do is warm up the sides, cook the beef patties, assemble the massive “burgas” all in less than 30 minutes. Then you can eat. They even have the endorsements of celebrity chefs Rachael Ray, Cuy Fieri, and Michael Symon. Do you know someone that would enjoy trying the Burgabox? Give them a Burgabox gift card and let them do the rest! I like to get my glass cooking dishes for the oven from Walmart. They offer Anchor Hocking and Pyrex brands in all sizes from small to large, round, square, and rectangle depending on what you want to put in them. I like the round ones for salads and side dishes. The square and rectangle work well for those casseroles, meatball, desserts, cakes, etc. Some come with plastic lids for storage, which you don’t want to put in the oven to melt. Use foil in it’s place in the oven. Any multi-piece set of Anchor Hocking dishes would make a nice gift for shower or wedding. Just look and you might be surprised at what kitchen tools you might find! If you don’t need a big set, just search and find the one you need. The Oneida 5 pc Cardiff Tool Set is a high-quality kitchen utensil set that comprises of a slotted turner, basting spoon, slotted spoon, ladle, and pasta scoop. In effect, it takes care of many of your kitchen tool requirements, so that you can dole out the delicacies conveniently for your lov ed ones. These nylon kitchen utensils are of exceptional quality and they can withstand temperatures up to 400 degree. They are dishwasher safe too making cleaning a snap. They come with a life-time warranty. Designed with ergonomic grips, they are easy to use, while the stylish looks will complement any kitchen. Walmart is even getting in on the meal kits. Be sure to click on the link below to see what it’s all about. No commitment involved. It can be a try it once to see what you think. Choose a different meal if you want to try again.